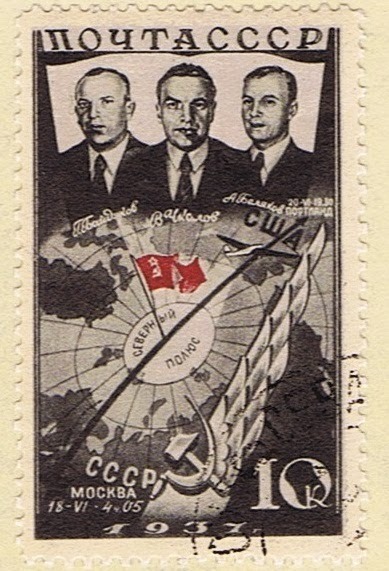 On April 10, 1938 the USSR issued a set of 4 stamps to commemorate the first trans polar flight that was completed between the 18th and 20th of June 1937. 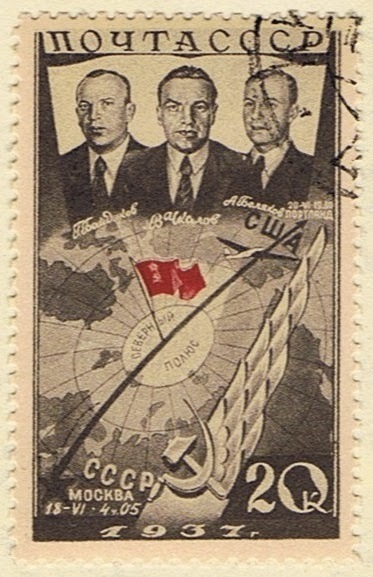 The stamps issued in 10k, 20k, 40k and 50k denominations the set all has the same design featuring the 3 aviators who flew on the flight with a map and the route taken. 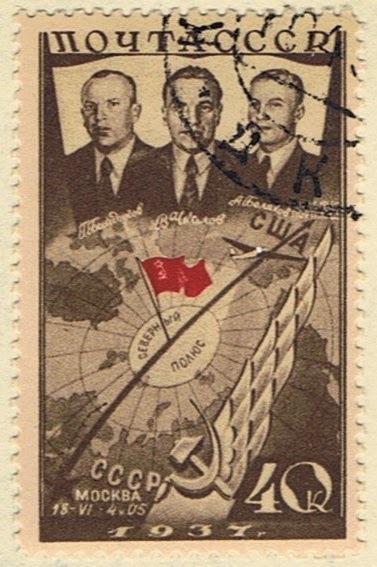 The flight departed Moscow's Shchelkovo airport at dawn on the 20th of June in an ANT-25 monoplane with pilot Valery Chkalov, Georgy Baidukov as co-pilot and Alexander Belyakov as navigator. 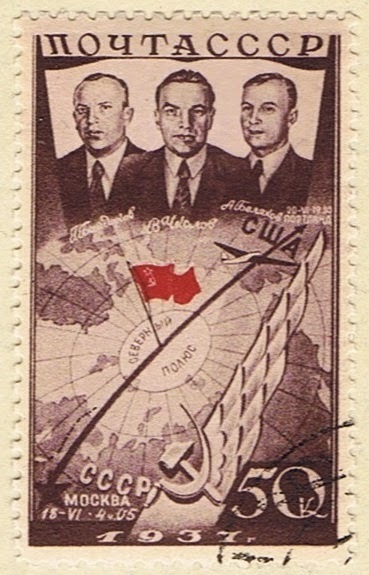 The trio were all experienced cold weather flyers who were decorated pilots for their flying in the polar regions of the Soviet Union in the ANT-25. For the first 24 hours of the flight very few people were aware of the flight due to security and the paranoia that existed in the USSR at the time. Once word got out however the world was enthralled and everyone was looking to get more information on how the flight was progressing. The first 24 hours of the flight has been described as routine. The rest of the flight however tested the skill and ability of the experienced crew. As the plane came nearer to the North Pole it's magnetic compass became useless and the crew had to navigate by dead reckoning. The weather was not cooperating with them either. The strong headwinds and storms slowed the flights progress increased the fuel consumption. The dangerous icing led to freezing of most of the liquids on the plane, including the engine coolant. Through the crews ingenuity they used their stored urine to solve this problem. After crossing the North Pole, the crew flew over Canada's north using dead reckoning as their method of navigation. Eventually a Canadian signal Corps post in the North West Territories heard the aircraft and contact was made. Based on information from the crew the advised that they would have to put down between Seattle, Washington and Oakland, California depending on the fuel that they had. To avoid further heavy storms they turned the plane west to continue their journey over the Canadian Rockies and down the Pacific coast. Just over Eugene, Oregon the ANT-25 developed a problem with it's fuel pump and the crew decided to land in Portland. After descending through the clouds and rain Chkalov saw large numbers of spectators waiting for them to land. Fearing that the crowds would damage the plane similar to what happened to Lindhberg when he arrived in Paris, the pilot decided to land at the military airfield across the river in Vancouver, Washington. Upon landing in Vancouver it was discovered they had 11 gallons of fuel left after traveling 5,288 miles in 63 hours and 16 minutes.